The Guyana government sought to assure residents that the country was prepared for an oil-spill and all companies engaging in offshore oil extraction must put in place measures to prevent or handle such an incident. “We have to put in place measures, which are more proactive rather than reactive and the companies that are operating offshore Guyana will have to satisfy us of those measures,” Minister of State, Joseph Harmon said at Friday’s closing of an Oil-Spill Response Training Course. That training course marked the end of a one-week Incident Command System (ICS) Workshop for Oil-related Disaster Preparedness. Harmon was quoted in a government press statement as saying that Guyanese can be assured that there are strong measures in place to protect their shoreline in the unlikely event of an oil spill. Minister Harmon explained that while an oil spill is unlikely to occur, this exercise is a necessary part of ensuring that the country is prepared for all eventualities as the oil and gas sector is developed. It brought together important stakeholders such as the Guyana Energy Agency (GEA), Ministries of Natural Resources, Legal Affairs, Public Infrastructure, Agriculture, Public Health and Foreign Affairs, the Guyana Defence Force (GDF), the Guyana Marine Conservation Society,the Guyana Revenue Authority (GRA), the Guyana Geology and Mines Commission (GGMC), and Guyana Civil Aviation Authority along with Exxon Mobil. “I trust that we will never have to get to this point [the point of an oil spill], but the fact that we are preparing for it, we are prepositioning equipment, we are training people and we putting them in various parts of the country, speaks to our ability to plan for these events,” the Minister said. Meanwhile, Minister of Foreign Affairs, Mr. Carl Greenidge, who was also present at the event, explained that his Ministry holds special responsibilities with regard to assuring the international investment community and the rest of the world of Guyana’s commitment to developing its petroleum industry in a sustainable way and in accordance with best practices. 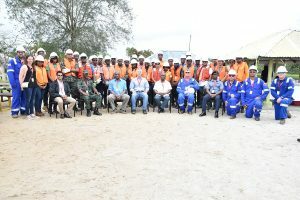 “Petroleum and gas exploration is one of the most important things to have come Guyana’s way in centuries and, therefore, it become especially important for us to be able to show that we recognise that in an important industry like this, there are responsibilities and requirements that go with having that industry resident here, such as safety issues, issues of awareness on the part of the population, capacity building and the like… This is part of the foundation of the industry, whenever and however emergencies may arise,” he said. The workshop was organised by the Ministry of Natural Resources in collaboration with the Civil Defence Commission (CDC) and Exxon Mobil, which provided the instructors. A total of 37 participants undertook to workshop, who were awarded with certificates after they gave a practical demonstration of the skills and training they have received over the past few days. Mr. Devon Reece, who represented the Fisheries Department of the Ministry of Agriculture, described the workshop as extremely useful, as he now has first-hand knowledge of the types of equipment that will have to be used in the event of an oil spill. He added that the networking aspect that the training provided, has allowed for participants to know and understand their individual and collective responsibilities. Similar sentiments were expressed by Mr. Romeo Defreitas, who said that the training was very beneficial but he hopes the need for the oil-spill response team never arises. He represented the Guyana Marine Conservation Society.